Taking cues from late 60s psych and various trippy Americana bands from more recent times, Norway’s Dig Deeper are a curious hybrid of Neil Young & Crazy Horse, Pink Floyd, Richmond Fontaine and a half remembered garage band from eons past. ‘In Central European Time’, the band’s third full length release, often plays like a dark road movie for the head and should appeal to fans of the aforementioned, possibly even those familiar with fellow Scandinavians The Bloakes, Trevor & The Joneses and King Black Acid. ‘How Can I Be Certain’ begins the album with something surprisingly upbeat. A repetitive guitar hook recalls the sounds of 90s jangle, while a sparse rhythm pushes everything forward with a near hypnotic mid pace. Over this, a wistful voice weaves in and out, never too intrusive; it’s slightly fey delivery doesn’t so much give away a Scandinavian bent as much as pay tribute to 90s indie. This fusion of styles will appeal to those who crave a rootsy sound with a slightly alternative sound instantly…and for those hoping for a deeper voyage into psych, wavering keys throw out sci-fi loops and – eventually – a rise in volume and the presence of a superb guitar solo make this sound like such a full and rewarding listen. An extended instrumental play out allows the band to show off their talents: the guitar work is constantly masterful without being tempted to drop into a genuinely dominant role, merely adding great textures to a solid groove, while drummer Raymond Tungesvig achieves the near impossible as he locks into the same rhythm throughout in a subtle tribute to great Krautrock. More than occasionally feeling like the work of a different band, ‘Stars Tonight’ opts for a more forceful sound and loud lead vocal that doesn’t charm in the same way at first, but a couple more plays exposes a fine song with more of a commercial edge. While the main riff doesn’t necessary grab the attention, it’s the infectious chorus with its multi-layered sound that eventually wins out. With wavering neo-futurist sounds coming through courtesy of various electronic treatments backing vocal harmonies inspired by modern Americana and timeless AM radio pop, ‘Stars Tonight’ would make an excellent single – an uneasy marriage of Band of Horses and Poco in space, if that makes sense. Whilst the album starts well, it’s upon reaching the third track where it starts to feel special. Slowing down several notches to an unashamedly Floydian pace, ‘Don’t Ask Too Much’ is essentially a seven minute showcase for Øystein Braut and Einar Kaupang’s dual guitar approach to weave ethereal musical phrases. At the outset, ringing sounds hint at melodies that in places are barely audible, before a soft rhythm gives clean guitar tones and occasional steel guitar sounds a base from which to grow. Right from first hearing, there’s something special – not to mention familiar – about the way the circular melody and country tinged guitars lay their foundations. It’s one of those numbers that just gets better with time and the way an alt-country base slowly swells into a swooning prog rock epic is a true marvel. Braut’s guitar, with heavy reverb, often reaches for those sounds that recall Neil Young’s classic ‘Cortez The Killer’, but shows so much more restraint, while the main vocal melody, too, is powerful. It’s almost as if the jangling 90s elements of the previous tunes have been cast aside and Dig Deeper have found their true calling, lost somewhere out on a dusty highway. Musically, lyrically and almost spiritually, this track feels like everything the band has aimed towards since the beginning of their career. The world of old Americana is both far stronger and more succinctly delivered on another album highlight ‘The Ticket’. A slow country rocker peppered by the spacious backing vocals of Dig Deeper’s own ‘Stars Tonight’, this is one of the album’s most immediate tunes. Never a million miles away from the quieter (for that read “less shouty-vocalled”) offerings from Jay Farrar and Son Volt, it often plays for a much straighter feel. With the guitar melodies peppered by a shameless steel echo, the Americana influences finally dominate and the timeless musical approach is a great bedfellow for a natural vocal, while Jørgen Knutsen’s bass, constantly high in the mix, pumps a steady sound. This, of course, doesn’t make it a lesser tune than the two or three epics on this disc [prog fans, take note: listening to needlessly long arrangements doesn’t make you more intelligent, nor are long tracks necessarily superior to a well written four minute chorus song], but rather more, it gives this record a true feeling of balance. Someone within the Dig Deeper ranks is a great songwriter and it’s great to hear a hook allowed to stand on its own; to hear vocals take precedence over wandering musicality. [First time listeners who feel they can’t devote a full hour to this album should cue this track up, followed by ‘Don’t Ask Too Much’. Both numbers serve as a broad and hopefully appealing introduction]. A steady rhythm and echoing guitar work are the musical staples of ‘Hey’, a number that mixes the best Americana sounds with a trippy psychedlic edge. Again, the rhythm section turns in some stellar work, while as before, an echoing lead guitar often straddles a fine line between country rock and arty prog. By this point of the record, it feels as if there are few surprises; everything here you’ve heard on the record previously, but the performance – one part Son Volt, three parts Euro prog [but infinitely more interesting than Airbag] – is thoughtful. Throwing hints of Pink Floyd’s ‘Echoes’ and ‘Eugene’ into something that – once more – eventually ends up nearer to the more restrained work of Crazy Horse – is a nice touch. The dual guitar work on the extended instrumental, once more, shows these guys as fine players; cerebral without being over-produced or over-perfect. While most of this album’s songs favour the lengthy approach, Dig Deeper completely give in to their seventies excesses and take things to extremes on the closing number ‘Sky Brown Sky’, a dark and sprawling piece that unleashes their darkest tendencies across ten minutes. Keen to leave a lasting impression, this number weaves a slow bass groove in and out of heavy echoes, sitars, finger-clicks and eventually works a repetitious sound into something that allows hard rock and proggy guitars to lay down strong leads. Beneath the simple Hawkwind throwback, inaudible echoing voices are added for maximum spook factor and all things considered, it’s a fine way to end this musical journey…unless you came looking for more Americana, of course. Fans of post-Syd/pre-‘Meddle’ Floyd, The Doors and Hawkwind circa 1972 will find so much to love within this track, it could become a favourite destined for heavy rotation. Yes…it’s that good. Dig Deeper might not be shy when it comes to showing some of their key influences, but it’s what they do with those that really counts. Behind the influences, it’s always possible to hear the work of a committed and interest band, exploring sonic textures both tight and loose; sounds that take the imagery of America’s dusty highways and replant them somewhere on a distant planet. The vocals take a little while to appreciate, but almost all of the music present on ‘In Central Europe’ is hugely appealing. 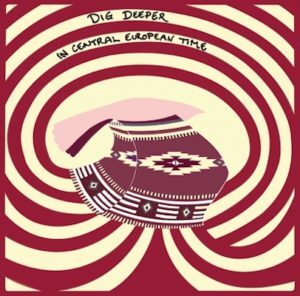 Take this one for a spin; it mightn’t sound like much first time around, but by that third or fourth play, it’s almost guaranteed you’ll find yourself unexpectedly drawn in by Dig Deeper’s disjointed travelogues. Recommended. This entry was posted in Album & EP Reviews and tagged alternative, prog, psychedelia, scandinavian by Real Gone. Bookmark the permalink.